Having the right fire detection system installed is not just about being compliant with the law; it's about peace of mind. At Nationwide Fire & Security we pride ourselves on our level of commitment in providing you wth the right system taylored to meet the needs of your business or institution. We ensure that your fire alarm system is fit for purpose and legally compliant while protecting your employees and your business. If you have five or more full-time employees, then by law you must conduct, record and regularly review a fire risk assessment. The risk assessment could, among other things, identify a need for a fire alarm system, fire extinguishers and emergency lighting. Fire alarm servicing should be carried out by a competent company with the relevant UKAS regulated certification. Failure to address this could invalidate your fire insurance. We are able to provide a wide range of services to contractors and other fire alarm companies - including third party certification of fire detection systems & full fire alarm equipment supply. 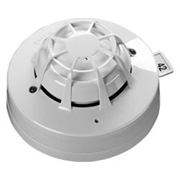 Optical Smoke Detectors - uses the light scatter principle - ideal for where slow burning or smouldering fires may occur. Ionisation Dectors - more traditional smoke detector using a low activity radioactive foil to detect fires by irradiating air in the smoke chamber, causing a current to flow - which is broken when smoke particles enter the chamber. Carbon Monoxide detectors - whilst carbon monoxide in itself can be a killer - for instance if there is a blockage in a heating system - it can also warn of the presence of a deep seated fire. All these detectors, along with manual point discovery can be integrated with a fire alarm system and BT redcare system so that a fire can be detected and announced asap giving you vital extra time to get yourself and your employees out of the building. We are a Gent 24 Approved Contractor. Click here for more information on our partnership with one of the leading manufacturers in the fire protection industry.